Europe's Elite is giving away 3 links (spots) for the webinar! All you need to do is repost this article by using the 'share' button via our facebook page, and we'll randomly pick 3 guys based on it! Europe’s Elite next webinar will take place March 16th 7pm Central European time and the topic will be "Keys to Successful QB Development". 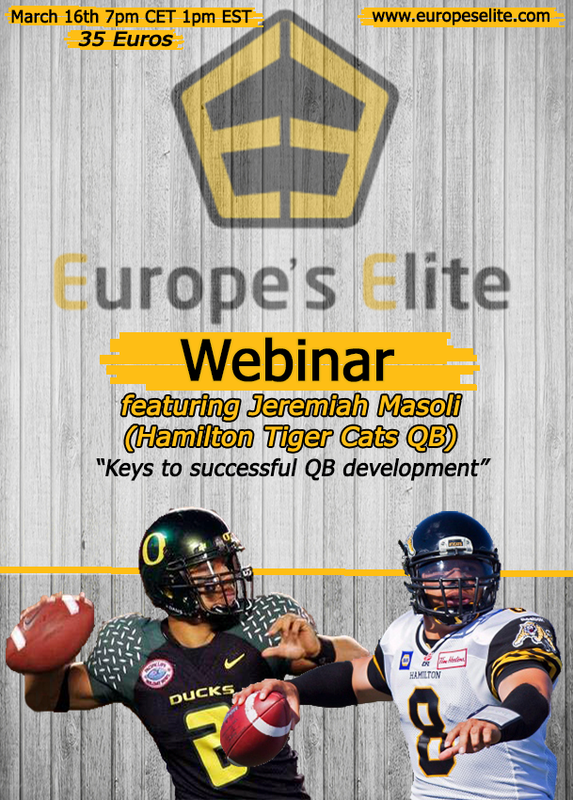 The presenter will be former University of Oregon and now current CFL Hamilton Tiger Cats QB Jeremiah Masoli. Evan Harrington of EE said that their webinars first purpose is to help the international football community to becoming better players and coaches. - We achieve this by having some of the top players and coaches present on key subjects sharing their knowledge and tips. Our second purpose is to help raise money to reduce the fees for the players going on our college camp tour. All money from our webinars go directly to cutting down the cost for their trip. We hope by hosting these webinars we can help the game of football grow internationally and help some young men get closer to their dream of playing college football. The word "webinar" is a combination of the word "web" and "seminar". A webinar is an event that takes place on the internet though a webcast and can be viewed by an online audience. The way Europe's Elite webinars work is after you have registered for the even you are sent a link that allows you to learn from the comfort of your own home. For more information about the Webinar, and how to sign up, CLICK HERE. Coach Masoli started his college career at San Francisco Community college where he lead his team to a Jr. College National Championship. He then accepted a full scholarship to play at the University of Oregon. He had a stellar career playing at Oregon under coach Chip Kelly leading the Ducks to 2 bowl games and a Pac- 10 Championship. After early graduation Masoli finished his Sr. Season at Ole Miss University. After his college career Masoli Signed with the San Francisco 49ers. Coach Masoli is now entering his 6th season in the CFL playing for the Hamilton Tiger Cats.